Standing beneath a blazing Outback sun with my wife and two children, I am staring at a rock. It’s a big rock -not as big as expected, but certainly impressive -and looks like a wave, hence the name. ‘It’s just a rock!’ protests my daughter, Emma, 14. Seemingly, all of Australia’s flies cloud round my head. My son, Sean, 12, wears a black fly-net over his face like a little beekeeper. Would it be bad form to steal it? ‘What did you expect to see at Wave Rock?’ Emma adds sarcastically. ‘We drove 250 miles to see a rock?’ asks Sean. This is the only problem with Western Australia: everywhere is 250 miles away. This is my fifth trip, and for some reason I always forget -maybe because it has so much else in its favour. It is worth the drive. The rock itself is only 110m long and 15m high, but from its summit we gaze over flatlands, taking in the lakes and strange geological formations. Twelve miles up the road we find a cave decorated by ancient Aboriginal handprints. Wave Rock campsite is busy, partly due to its location midway between Perth and the seaside resort of Esperance, which explains why so many cars out in the desert are towing boats. Thankfully the icy-cold swimming pool is empty -ready to remove all that desert sand. 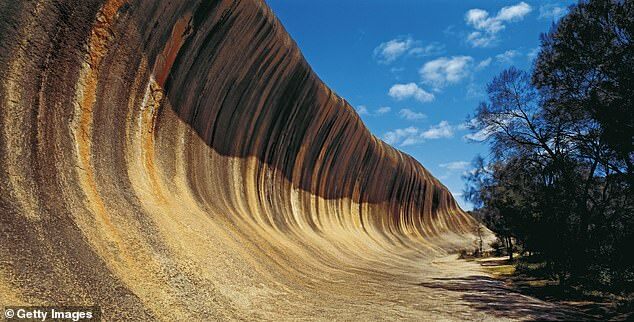 After another look at Wave Rock -perennially changing with the light -we drive off in the vague direction of the coast.